China Telecom, the large international communications carrier with close ties to the Chinese government, misdirected big chunks of Internet traffic through a roundabout path that threatened the security and integrity of data passing between various providers’ backbones for two and a half years, a security expert said Monday. It remained unclear if the highly circuitous paths were intentional hijackings of the Internet’s Border Gateway Protocol or were caused by accidental mishandling. For almost a week late last year, the improper routing caused some US domestic Internet communications to be diverted to mainland China before reaching their intended destination, Doug Madory, a researcher specializing in the security of the Internet’s global BGP routing system, told Ars. As the following traceroute from December 3, 2017 shows, traffic originating in Los Angeles first passed through a China Telecom facility in Hangzhou, China, before reaching its final stop in Washington, DC. 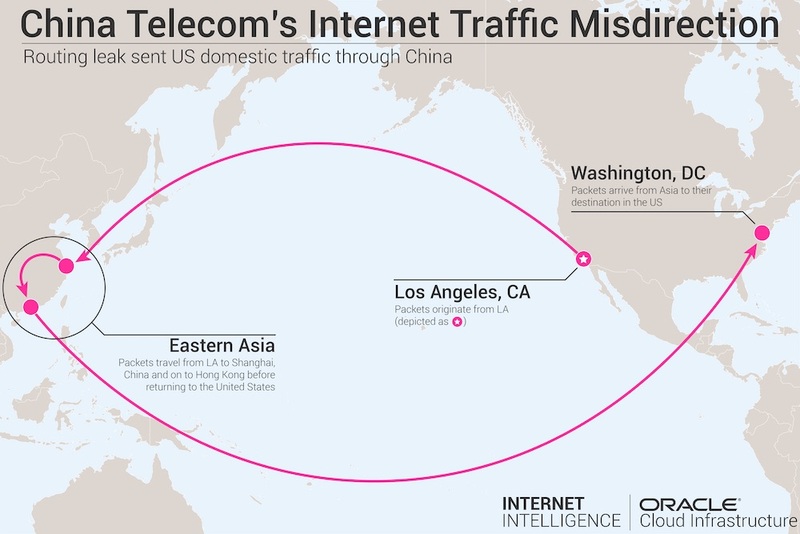 The problematic route, which is visualized in the graphic above, was the result of China Telecom inserting itself into the inbound path of Verizon Asian Pacific. The routing snafu involving domestic US Internet traffic coincided with a larger misdirection that started in late 2015 and lasted for about two and a half years, Madory said in a blog post published Monday. The misdirection was the result of AS4134, the autonomous system belonging to China Telecom, incorrectly handling the routing announcements of AS703, Verizon’s Asia-Pacific AS. The mishandled routing announcements caused several international carriers—including Telia’s AS1299, Tata’s AS6453, GTT’s AS3257, and Vodafone’s AS1273—to send data destined for Verizon Asia-Pacific through China Telecom, rather than using the normal multinational telecoms.